The issue, tracked as CVE-2018-19788, impacts PolicyKit version 0.115 which comes pre-installed on most popular Linux distributions. Why not give Linux, which dominates all other computing markets, a try? “Most people today are using Linux without ever knowing it.” Find out where you’ll see it. A review of Linux disk cloning with tool called dd. They will demonstrate the basics of how to deploy, configure and maintain high availability/clustering in Ubuntu. In this, you can learn about performance tuning MySQL. How to create an Advance Login System in C# and MySQL database. “The installation is a bit tricky, so be prepared to do a bit of work.” Get ready to learn. Learn the seven considerations before updating WordPress. What do brands need to bear in mind in 2019 to ensure that they continue to deliver relevant standout online design, and therefore sales? The exposure occurred between September 12th and September 25th. DOD IG officials inspected five random locations where the Missile Defense Agency had placed ballistic missiles part of the Ballistic Missile Defense System. SQLite is a lightweight, widely used disk-based relational database management system that requires minimal support from operating systems or external libraries. WordPress versions 5.0 and earlier are affected by the following bugs. She built one of the original computerised airline reservation systems. Google’s AI research division has made promising progress toward a performance model. The company believes the reinforcement learning platform can prove helpful in dealing with massive data sets. The Linux version of ProcDump does not offer all of the same features that the Windows version does. Samsung is announcing the beta launch of Linux on DeX which extends the value of Samsung DeX to Linux developers. If you are new to ARM templates and would like to try it, you can start by following these steps. TiDB is an open source NewSQL database released under the Apache 2.0 License. This method is so useful when you retrieve all the data in the column of the table in the database. The tool also aims at educating you on what steps you can take to improve your web site based on the audit. IoT brings changes to software development on many levels, including web development. He said, “I order my employees or secretaries” to do it. They develop AI-based products to prevent cyber attacks on companies and recently considered filing for an IPO. All the data on those 6,500 sites are toast. GDPR’s First 150 Days Impact on the U.S. Roughly 150 days after the passage of one of the most significant data privacy laws ever, how has it impacted U.S. companies’ privacy efforts? The vulnerability resides in the way Facebook search feature displays results for entered queries. Thanks to its AI-backed software, that personalization is also done at low-cost, helping students vault one of the major barriers to education. Neighborhood activists sued, claiming the exemption broke state law. The Telephone Robocall Abuse Criminal Enforcement and Deterrence (TRACED) Act, raises the penalty for robocalls from $1,500 per call to up to $10,000 per call. One dollar’s worth of bitcoin takes about 17 megajoules of energy to mine. We’re officially well into 2018! All of our resolutions and strategies are set in action and it’s time to check in to see how you’re doing so far. From Burger King explaining Net Neutrality to the Linux, Meltdown and Spectre battle, this month has been interesting thus far. If you’re looking for some inspiration or just good content, check out our first 2018 round up! If you enjoy this collection of the web’s top articles, feel free to follow us over on Facebook, Twitter, and Google+ for the same great content the rest of the year. The Linux developers has made a lot of progress in dealing with the Meltdown and Spectre, but there’s a lot of work left to be done. What Happens When You Want to Create a Special File with All Special Characters in Linux? Learn how to handle creation of a special file filled with special characters. Does DevOps Plus Open Source Equal Security? Many IT organizations are now moving to DevOps simply because they’re being instructed to do so by the business or because this is the answer they get from their peers and the market. Check out a a free Linux tool that can detect Meltdown vulnerability exploitation attempts. Find out how open source helps Facebook to share insights and boost innovation. Open source is an amazing asset that is putting everyone on an even playing field and is allowing all companies to become flourishing tech companies. Find out why user testing is important. Grow as a developer this year, here’s your guide to your master plan. Take a look at these popular design trends and how you can integrate those trends into your branding. If one of your resolutions this year is to read more, you’re in luck! Check out this reading list for WordPress web designers. Here’s a list of mistakes that often slip past overburdened security pros, don’t let it pass you by! Experts say it’s not enough to just post data classification guidelines and revisit the topic once a year. Companies have to build in privacy by design. As the explosive growth of IoT continues, businesses, vendors and consumers all have to confront the issue that the world is more connected than ever before, with potentially gigantic consequences. Will 2018 Be The Year We Say Goodbye To Passwords? Users choose passwords poorly. Explore other alternatives for security, other than a bad password. Under WPA3, security will be baked deeper into wireless configuration, making it harder to misconfigure or to avoid. Over 2,000 WordPress sites are infected with a malicious script that can deliver both a keylogger and the in-browser cryptocurrency miner CoinHive. Net neutrality is a complicated topic to explain, which is where Burger King came in with a meaty metaphor. An analysis of comments submitted to the U.S. FCC’s consultation on the future of the nation’s net neutrality rules has shown the whole process of public comments was fatally flawed. Senate Democrats Push for a Net Neutrality Vote. Do They Have a Chance? Senate Democrats announced that they were one supporter away from winning a vote to restore the so-called net neutrality rules, but they have a long way to go before they are able to reinstate rules. It’s time to say goodbye to 2017 and hello to 2018. As we wrap up the end of this year, we take a look at AI finding its way in cybersecurity, the FCC killing net neutrality, and someone accessing internet connection with wet string. Whatever 2018 has to throw upon us, stay ahead of the curve, check out this roundup and enjoy the rest of December’s best content! If you enjoy this collection of the web’s top articles, feel free to follow us over on Facebook, Twitter, and Google+ for the same great content the rest of the year. The holidays are right around the corner. It’s time to get your site ready and prepare for this festive season! From net neutrality, security breaches and McDonald’s accepting Bitcoin as a form of payment, technology is evolving and getting more complicated by the minute. Check out this roundup and enjoy the rest of November’s best content. If you enjoy this collection of the web’s top articles, feel free to follow us over on Facebook, Twitter, and Google+ for the same great content the rest of the year. The solar eclipse has come and gone and we’re all still here. So onto the August edition of our monthly roundup! Let’s take a quick sneak peek at the last thirty days of news. Highlights include a .fish website that was actually a phishing site, the split of Bitcoin, and the emergence of Whoppercoin. Interest piqued? Feel free to jump into the roundup and enjoy the rest of August’s best content. If you enjoy this collection of the web’s top articles, feel free to follow us over on Facebook, Twitter, and Google+ for the same great content the rest of the year. It’s time for July’s edition of our monthly roundup! Let’s take a quick sneak peek at the last thirty days of news. Highlights include an introduction to getting started on Open Source Friday, a look at the development of Silicon Valley’s HotDog/Not HotDog app, and an interesting visualization that shows what happens after a ransomware victim makes a Bitcoin payment. We’ll refrain from spoiling the entire roundup and let you jump right into July’s best content. If you enjoy this collection of the web’s top articles, feel free to follow us over on Facebook, Twitter, and Google+ for the same great content the rest of the year. It’s time for June’s edition of our monthly roundup! Let’s take a quick sneak peek at the last thirty days of news. Highlights include a new Girl Scout’s badge for cybersecurity, Let’s Encrypt issued certificate number one-hundred million, and GitHub introduced a new weekly way to contribute to open source. What are you doing this Friday? We could keep going, but we’ll let you jump right into June’s best content. If you enjoy this collection of the web’s top articles, feel free to follow us over on Facebook, Twitter, and Google+ for the same great content the rest of the year. It’s time for May’s edition of our monthly roundup! Highlight of the last thirty days include a neural network creating new paint colors with names like Stanky Bean and Dorkwood, a court ruling that open source licenses are enforceable contracts, and a ransomware attack the likes of which the world has never seen. We could keep going or you could jump right into May’s best content. If you enjoy this collection of the web’s top articles, feel free to follow us over on Facebook, Twitter, and Google+ for the same great content the rest of the year. It’s monthly roundup time! April’s edition takes a trip through the open source galaxy, from the aerospace industry to a new social network. In other news, Unity is no more, Hollywood has been hacked again, and the Internet of Things is ready to play some cricket. With a preview like that, we know you’re ready to jump right into April’s best content. If you enjoy this collection of the web’s top articles, feel free to follow us over on Facebook, Twitter, and Google+ for the same great content the rest of the year. It’s monthly roundup time! March’s edition takes you into the mind of the open source contributor, looks at recent security issues, and even has an article about the Commodore 64. Ready to read? Jump into March’s best below. If you enjoy this collection of the web’s top articles, feel free to follow us over on Facebook, Twitter, and Google+ for the same great content the rest of the year. From Munich’s impending breakup with Linux to the disclosure of the Cloudbleed vulnerability, February was definitely a month for broken hearts. In the positive news category, over half of the web is encrypted, which is a major step forward and in no small part thanks to Let’s Encrypt. We don’t to spoil the entire roundup for you, so without further ado, jump into the rest of February’s best below. If you enjoy this collection of the web’s top articles, feel free to follow us over on Facebook, Twitter, and Google+ for the same great content the rest of the year. Cybersecurity was a pretty central theme around the world in 2016 and, in many ways, that will continue to be true in 2017. With that in mind, we’ll be adding a cybersecurity section to our monthly roundup, which should help you stay up with the constantly changing security landscape. Additionally, this roundup is pretty full of suggestions and projects for 2017. It’s not too late to get started on your New Year’s resolution to learn to code or start an open source project. Without further ado, jump into the rest of the roundup below. If you enjoy this collection of the web’s best, feel free to follow us over on Facebook, Twitter, and Google+ for the same great content the rest of the year. Wow. 2016 was quite a year. In the good category, we saw the 25th anniversary of Linux and the continued rise of open source. In the not so good, we saw the birth of the Internet of Things enabled DDoS attack. This month’s roundup looks back at the year that was and ahead to the year that will be. Is 2017 the year that chat takes over. That Linux finally dominates the desktop? We shall see. Without further ado, jump into the rest of the roundup below. If you enjoy this collection of the web’s best, feel free to follow us over on Facebook, Twitter, and Google+ for the same great content the rest of the year. Hope everyone had a great Thanksgiving! Be forewarned that this roundup of November’s best content does not include any turkey, mashed potato, or stuffing leftovers. It does include a look at the future of native apps, a timely look back to 1992 when Presidential campaigns first went online, and an update from BFFs Microsoft and Linux. That’s the quick roundup. Jump into the rest of it below. If you enjoy this collection of the web’s best, feel free to follow us over on Facebook, Twitter, and Google+ for the same great content the rest of the year. October was National Cyber Security Awareness Month and, boy, was it a doozy. The biggest story of the month was an IoT botnet powered DDoS attack against Dyn that impacted large portions of the internet including popular sites such as Twitter and Reddit. No less serious was the revelation of a previously known, but unpatched, Linux bug that has since been patched. In happy news, KDE turned 20 years old, so don’t forget to wish their team a happy birthday. Before we spoil the entire October roundup, we’ll let you get to it. If you enjoy this collection of the web’s best, feel free to follow us over on Facebook, Twitter, and Google+ for the same great content the rest of the year. The biggest news this month had to have been the discovery of a Commodore 64 running an auto shop in Poland. Or it might have been the fact that Chipotle started testing drone delivery of burritos. Or it just might have been the release of a new version of Vim after over a decade. Pretty exciting, right Vim enthusiasts? Or we can just let you jump right into our roundup of September’s best and let you decide what was newsworthy. If you enjoy this collection of the web’s best, feel free to follow us over on Facebook, Twitter, and Google+ for the same great content the rest of the year. The big news from August was Linux’s 25th birthday. Even Linus Torvalds had no clue how he was going to change the world. In other major internet events, we celebrated the 25th Internaut Day on August 23rd, but is the holiday based in fact? And finally, we may have an end to the tabs or spaces debate. It only took fourteen terabytes of code to get there. With the ten second roundup complete, we’ll let you get to the rest of the biggest stories and best articles from last month. If you enjoy this collection of the web’s best, feel free to follow us over on Facebook, Twitter, and Google+ for the same great content the rest of the year. There was really only one story this summer. And that was obviously the arrival of Pokémon Go, which took the world by storm and was the most downloaded app ever in a first week. Developers take notice. Okay, so maybe some other things happened. Like Bulgaria requiring the use of open source in all government projects, Linux 4.7 came out, and oh yeah, Pokémon Go!! That’s the five second roundup. Feel free to check out the unabridged edition below. If you enjoy this collection of the web’s best, feel free to follow us over on Facebook, Twitter, and Google+ for the same great content the rest of the year. Summer has started, which makes these roundups of ours even more necessary. You do your job and enjoy the sun and we’ll find the best content from around the web, so that you can peruse it from the comfort of your beach chair. June’s roundup includes a nice post from Dries Buytaert on the “long path to [open source] being understood, a look at the importance of code review, and Mary Meeker’s annual Internet Trends Report. That’s the five second roundup, check out the unabridged edition below. If you enjoy this collection of the web’s best, feel free to follow us over on Facebook, Twitter, and Google+ for the same great content the rest of the year. MajQa’ Dub! If you’re confused, that means welcome back in Klingon. What’s that got to do with the best web development content, you say? Keep reading to see how this fictional language could have a major impact on the future of programming. In other news, Linux 4.6 is out, Apple is promising to approve apps faster, and a really cool interactive website came out that documents the history of chart topping music. That’s the five second roundup, check out the unabridged edition below. If you enjoy this collection of the web’s best, feel free to follow us over on Facebook, Twitter, and Google+ for the same great content the rest of the year. If the big Windows-Linux announcement had happened on April Fools’ Day, people would have thought it was a incredibly well-orchestrated trick. That’s not the case though. Twenty-five years after the world was introduced to Linux, open source has definitely made its mark. So has Minecraft. Check out last month’s in-depth post from The New York Times and if you’re a Minecraft user, definitely visit the world they created. In the past month, we have also published a few posts around the web that we’ve included in a new section of the roundup below. If you enjoy this collection of the web’s best, feel free to follow us over on Facebook, Twitter, and Google+ for the same great content the rest of the year. Since our last roundup, there have been a lot of celebratory days. Leap Day. Pi Day. St. Patrick’s Day. And now it’s roundup. It’s been an interesting March so far, with Microsoft’s big Linux decision, the results of Stack Overflow’s Developer Survey, and even a story about hackers and piracy on the high seas. Feel free to check out those posts and peruse the rest. If you enjoy the roundup, feel free to follow us over on Facebook, Twitter, and Google+ for the same great content the rest of the year. It’s that time again. Our monthly roundup of the best content from around the web. We have posts looking at how as open source becomes the norm, the community will expand and evolve in many ways. Looking to improveme your programming skills this year? We got you covered. And don’t forget to take a trip to the Malware Museum, a cool new project from the Internet Archive. If you enjoy the roundup, feel free to follow us over on Facebook, Twitter, and Google+ for the same great content the rest of the year. Who’s excited that it’s 2016? We are!! And if the content already hitting the web is any indicator, it’s going to be a great year all around. In this first roundup of 2016, we address some of the big questions for the year ahead. After a big 2015, will open source and Linux continue to dominate the tech world in 2016? Will the proliferation of apps continue? Will we finally get drone delivery? For the answers to these questions and more, check out our collection of January’s best content here. If you enjoyed the roundup, feel free to follow us over on Facebook, Twitter, and Google+ for the same great content the rest of the year. Have you seen the new Star Wars movies yet? This is a no spoiler zone, but let’s just that it’s glorious. And, while it may seem like it, the force awakening was not the only thing to happen since our last roundup. Swift went open source, and frankly, so did the rest of the world. And in a big development, humans finally outnumber bots on the web again. So that’s nice. You can check out the rest of the best from November and December below. If you enjoyed the roundup, feel free to follow us over on Facebook, Twitter, and Google+ for the same great content the rest of the year. Hope everyone has a great holidays! We’re just going to say it now. This is a fun roundup. 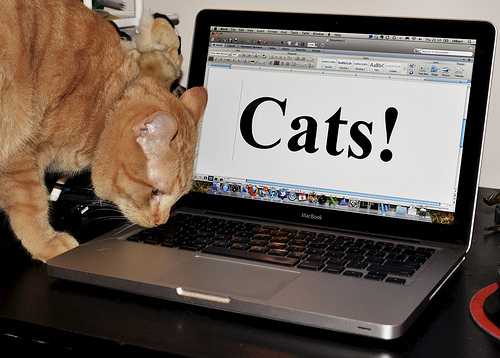 The big news of the month had to have been the disclosure that cats sitting on keyboards are causing bugs all over the place. Maybe if people didn’t dress them up, they wouldn’t act up. Although the graphic novel representation of the iTunes Terms and Conditions is quite epic. And have you heard the news? They found a Nintendo Playstation, and it works. For more industry related articles, check out the best posts from October and November below. If you enjoyed the roundup, feel free to follow us over on Facebook, Twitter, and Google+ for the same great content the rest of the year. Since our last roundup, there’s been a lot of action in the world of open source, including the news that open source is now a 5-billion dollar industry. In other news, GitHub has big plans for the future, fake traffic is throwing a wrench at online advertisers, and Ada Lovelace Day was celebrated to honor the pioneering spirit of women in tech. For the rest of the best from September and October check out the rest of the roundup below. If you enjoy this collection of industry articles, feel free to follow us over on Facebook, Twitter, and Google+ for the same great content the rest of the year. Since we last gathered for a roundup, there have been a number of significant and newsworthy events. Linux turned 24. Happy Birthday to our favorite open source kernel. In other open source news, Let’s Encrypt issued their first free SSL certificate, hopefully ushering in a new era of online security. From the land of the fun and interesting articles, we have the story of Twins.com, the website Major League Baseball can’t by. For the rest of the best from August and September check out the rest of the roundup below. If you enjoy this collection of industry articles, feel free to follow us over on Facebook, Twitter, and Google+ the rest of the year. Will Windows 10 finally be able to put down this pesky Linux uprising? That’s to be determined, but in the links below you will a Linux user’s perspective on the new Windows OS. So that may provide you a clue. In other news, IBM is teaming with Ubuntu and getting into the Linux mainframe business, and the legendary Amiga computer turned 30. For the rest of the important and the interesting from July and August, check out the rest of the roundup below. If you enjoy this collection of industry articles, feel free to follow us over on Facebook, Twitter, and Google+ the rest of the year. Now that the fireworks and Fourth of July are in the rearview mirror, it’s back to business. And for us, that means getting you your regular roundups of the previous month’s best web hosting, open source, and generally interesting content. That doesn’t mean you can’t do your work from the beach though. Getting to the big news from June, Apple announced plans to open source Swift 2, Github released Atom 1.0, and one man started printing Wikipedia. For the rest of the important and the interesting from last month, check out the rest of the roundup below. If you enjoy this collection of industry articles, feel free to follow us over on Facebook, Twitter, and Google+ the rest of the year. Each month we put together a roundup of the most interesting, most important, and, sometimes, most fun content from the open source, web hosting, and technology communities. This past May saw the release of both Debian 8 and Fedora 22, so there was much rejoicing in the Linux community. Read up on the new releases below. One of the more interesting posts from last month was a photo-mining project that creates motion capture videos only with photos publicly available on the Internet. It’s definitely a fascinating look at the sharing world we live in. For the rest of the important and the interesting from last month, check out the rest of the roundup below. If you enjoy this collection of industry articles, feel free to follow us over on Facebook, Twitter, and Google+ the rest of the year. It’s been a busy time in the web hosting industry since our last roundup. WordPress released version 4.2 and then promptly announced security release 4.2.1, eCommerce platform Magento major vulnerability of its own, and GitHub was rocked by a major DDoS attack. Too bad they weren’t bad April Fools Day jokes. But it wasn’t all bad news in April. For those of you who always felt like you didn’t quite fit in with Generation X or the Millenials, as you’ll see below, we are now the Oregon Trail Generation. So that’s nice. For the rest of the important and the interesting from the world of technology, check out the rest of the roundup below. If you enjoy this collection of industry articles, feel free to follow us over on Facebook, Twitter, and Google+ the rest of the year. After millions of comments from the public and months of debate, a net neutrality decision has finally been made. And the Internet will remain open and equal for all. You can take a look at the specifics of the decision in the roundup below. Other big news so far this March has included the release of the first Ubuntu phone as well as the very unexpected shutdown of Gigaom. There’s also a look at the impact of SteamOS on Linux gaming and the interesting story of the world’s oldest dot-com, which recently turned thirty. For the rest of the news thus far in March, check out the roundup below. If you enjoy this collection of industry articles, feel free to follow us over on Facebook, Twitter, and Google+ the rest of the year. Since our last roundup, quite a bit has happened. WHMCS recently announced that version 6.0 is on the way, which is all the more exciting when considering our new partnership with WHMCS. The annual “Who Writes Linux” report is out and full of sorts of valuable information about the community. A couple of posts we included look at the idea of a Linux distro ‘dying,’ a sad but unavoidable fate for some smaller distros. In other big news, FCC Chairman Tom Wheeler made quite a pivot on the net neutrality issue, and you should definitely check out his OpEd below. And since all the articles can’t be serious, don’t forget to check out one man’s project to use computer data to best find Waldo. Now that we’ve built the anticipation, get at it. Check out the roundup below to catch up on all the news so far in February. If you enjoy this collection of industry articles, feel free to follow us over on Facebook, Twitter, and Google+ the rest of the year. Enjoy! For this first mid-month roundup of the year, we have the pleasure of being able to present you some of the best articles from the end of 2014 as well as a few that have gotten 2015 off to a good start. By all accounts it was a great year for Linux and open source, and we can only imagine that 2015 will be even better. It’s also going to be a great year around Future Hosting, and the entire team is very excited to announce our own partnership with WHMCS that will be beginning in 2015. So without further ado, check out the roundup below and catch up on all the rest of the major happenings from December. If you enjoy this collection of industry news, feel free to follow us over on Facebook, Twitter, and Google+ the rest of the year. Enjoy! This November, the Linux Foundation announced that over 300,000 people signed up for the “Introduction to Linux” MOOC that they partnered with edX to offer. Don’t worry if you didn’t catch it this time around, they are offering it again this winter (the link is included in the post below). Since our last roundup, Microsoft also open sourced .net and EFF announced that sometime in 2015 SSL certificates will be free for everyone. As we’re getting toward the end of the year, there are starting to be a few “best of” lists popping up, a couple of which we shared. So without further ado, check out the roundup below and catch up on all the rest of the major happenings from November. If you enjoy this collection of industry news, feel free to follow us over on Facebook, Twitter, and Google+. Enjoy! Since our last roundup, there have been a lot of news stories that impact the worlds of open source and web hosting. Little battles continue to rage in the Linux and open source communities that are challenging the camaraderie of these groups. The discovery of Shellshock and SSL 3.0 vulnerabilities are just a continuation of what has already been a rocky year for security. It’s not all bad though. Last month’s best articles also included the news that you can get a college scholarship for playing video games. Without further ado, check out the roundup below and catch up on all the rest of the major happenings from September and October. If you enjoy this collection of industry news, feel free to follow us over on Facebook, Twitter, and Google+. Enjoy! In the month or so since our last roundup, there’s been a lot going on in the world of open source, web hosting, and technology. There’s currently a spirited debated happening in the Linux community over systemd and the future of the Linux desktop, which a couple of articles below touch on. In news of general interest, the web passed one billion websites recently, a feat that took nearly twenty-four years. It will be interesting to see how much faster the next billion are created. To catch up on all the rest of the major happenings from August and September, check out the rest of the roundup below. If you enjoy this collection of industry news, feel free to follow us over on Facebook, Twitter, and Google+. Enjoy! Since our last roundup, it’s been a busy month for open source, web hosting, and general tech news. The big story from August thus far has to be that the free Intro to Linux MOOC started over at edX. If you haven’t signed up yet, you still have time. To catch up on all the other major happenings of the past thirty days and enjoy some interesting perspectives on the industry, check out the rest of the roundup below. If you enjoy this collection of industry news, feel free to follow us over on Facebook, Twitter, and Google+. Enjoy! It’s time for another monthly roundup, which means you’ve come to the right spot for July’s most relevant news from the Linux/open source communities as well as the web hosting industry. Additionally, we also like to share the most interesting tech stories we come across from around the web, which are highlighted by the revelation that an Arnold Shcwarzenegger programming language exists and that people are still using DOS. We hope you find these posts fun and informative. If you like what you see here, feel free to follow us the rest of the month on Facebook, Twitter, and Google+. Enjoy! So it’s already been thirty or so days since our last roundup. If you’re new to this, here’s the deal. Knowing it would take a lot of time and effort to continually hunt down the best stories floating around the internet, we’ve taken it upon ourselves to round up the best stories for you each month. This time around we’ve shared the usual assortment of great articles that we’ve come to expect from the Linux and open source communities, news from the web hosting industry, and a handful of stories that are just generally interesting and relevant to the technology world. We hope you find these posts valuable and informative. If you like what you see here, feel free to follow us the rest of the month on Facebook, Twitter, and Google+. Enjoy! In our last roundup, the biggest news involved the OpenSSL heartbleed bug as well as the end of Windows XP support. Thirty days later, these two subjects are still a major part of the news cycle, but it’s the recent FCC decision to abandon net neutrality that has been causing the biggest waves. In addition to those recent stories, we’ve shared a handful of our favorite open source and web hosting articles from the end of April and the beginning of May. We hope you find these posts valuable and informative. If you like what you see here, feel free to follow us the rest of the month on Facebook, Twitter, and Google+. Enjoy! In the month since our last roundup, there has been a lot of important news in the tech industry. Some of the biggest stories from the last thirty days include the OpenSSL security bug, the end of Windows XP support, and the announcement that the IRS will classify Bitcoin as property, not currency. In addition to those current news stories, we’ve shared our favorite open source and web hosting articles from the end of March and the beginning of April. We hope you find these posts valuable and informative. If you like what you see here, feel free to follow us the rest of the month on Facebook, Twitter, and Google+. Enjoy! If you’ve been following us on Facebook, Twitter, and Google+, you’ll know that we like to use those channels to share the most interesting content that we come across each day. Realizing that it can be hard for to find the quality stories in all the noise and clutter, we decided to to collect the best articles we’ve read each month and create this roundup for our readers. Since this is our first edition, we’ve included the best so far from March as well a few from February. We hope you find these posts valuable and informative. Enjoy! Usually there are two ways to look forward to buy a Raspberry Pi: first, think about a strange thing to make, and then go to the website; or second, buy the Raspberry Pi board having no idea of what you are going to do with it.